Perhaps you're familiar with the popular blog, How About Orange. Jessica Jones is a graphic and textile designer with a flair for writing about crafty topics that inspire. Often she posts tutorials of her own clever projects, and also spotlights free digital downloads and funny, little quizzes she unearths around the web. 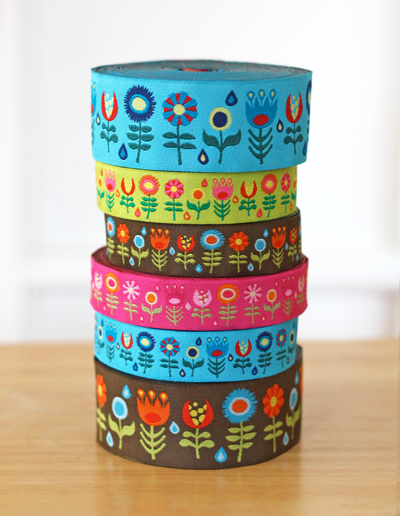 Recently Jessica unveiled a new line of floral jacquard ribbon that features her own bright designs, and my first thought was that the whimsical flowers would be perfect to translate into a quilled card design. I couldn't refrain from giving them a try over the weekend. Thanks Jessica, for allowing me to show the result here - your fantasy flowers are a much-needed taste of spring. I chose the ribbon color with you in mind, of course! I'm sure you all know this, but want to be clear that when you use the original design of another, ask for permission. As long as you won't be making something with it for anything other than your own personal use, it's usually fine, but please take the time to check. Great name for a blog, which I will check out. Nice ribbon, love the way the card came out , the flowers look so close to the ones on ribbon,wow! Your card came out soo cute! I love it! So happy, cheery and colorful. Thanks for the Monday dose of color! Such a bright and happy card Ann. Your quilling such a pleasure to see. I am a follower of how about orange and just love her blog. Great translation of the ribbon flowers to quilling. I love, love, love how colourful it is. I love Jessica's stuff. I think the card you did is fantastic! So bright and cheery! That is amazing! And I have heard of her blog a LOT ... need to go see it! Oh, I love the How About Orange blog!!! Ann, you did such a wonderful job on the card.. love it! A perfect example of being inspired without copying! I've never seen that blog before but as soon as I'm done here I'm headed over. Love those ribbons and the quilled flowers are fantastic. ooh! Looks like maybe the tape and the cards should be showcased together? A wonderful example of inspiration source and end result. Beautiful! Thanks everyone, so glad you liked it! Your card is fantastic, I love how vibrant it looks and how you captured the details from the ribbon. I've been lurking about How About Orange for a few years and love her inspiration as well. Your card is wonderful!!! I love the bright colors and clean lines. I "favorite" so many of your posts I don't know if I will ever have time to try out all these new ideas...thank you so much for all the wonderful inspiration!!!! I love how your rendition of the ribbon turned out! I love when I see something in real life that I just can't wait to turn into quilling!